SPSS Python Essentials - How To Install? We think SPSS with Python is great! However, you need to have the SPSS Python Essentials properly installed in order to use it. This tutorial gives a quick overview of installing and then testing them for different SPSS versions. Starting from SPSS version 18, Python, SPSS Python plugin and some extra modules are available as a single installer file known as the SPSS Python essentials. The table below gives a quick overview of how to get them and install them. For SPSS versions 21 and higher, you need to select the SPSS Python Essentials during the installation process of SPSS. If you didn't do so, you'll have to reinstall SPSS with the Python Essentials from scratch. The SPSS Python Essentials for these SPSS versions are not available separately and can't be added to SPSS if it's already been installed. For these SPSS versions, you first just install SPSS. Tip: Google to see if there's any fixpacks for your version before proceeding: the precise version of the Python Essentials depends on which fixpack(s) you installed for SPSS. Next, download the SPSS Python Essentials from the IBM SPSS website and install them. For SPSS 14 through 17, you first just install SPSS. Tip: Google to see if there's any fixpacks for your version before proceeding: the precise version of the Python Essentials depends on which fixpack(s) you installed for SPSS. Second, install Python. It's important you install the exact right version (usually 2.5, 2.6 or 2.7). Third, install the SPSS Python plugin. Unfortunately, we couldn't find versions 14 and 16 anywhere online. Since Python for SPSS was introduced in version 14, you can't use Python with SPSS versions 13 and lower. A simple way to test if the Python Essentials have been succesfully installed is to run some syntax that uses Python. The syntax below provides for a quick test. *1. Create mini test data. data list free/v1 to v5. *2. Try and retrieve variable names from test data. If the Python Essentials are running properly, you should see a Python list holding the variable names in your SPSS output window that looks like [u'v1', u'v2', u'v3', u'v4', u'v5'] (The ‘u’ here is for Unicode.) If the SPSS Python Essentials are not running properly, you'll get the error message in your output window shown below. If something is not working, you may navigate to Edit Options File Locations for further inspection. If the Python Essentials have been installed, the File Locations tab should look like the screenshot below. If you did not properly install the SPSS Python Essentials, the file locations for them will be greyed out as shown below. 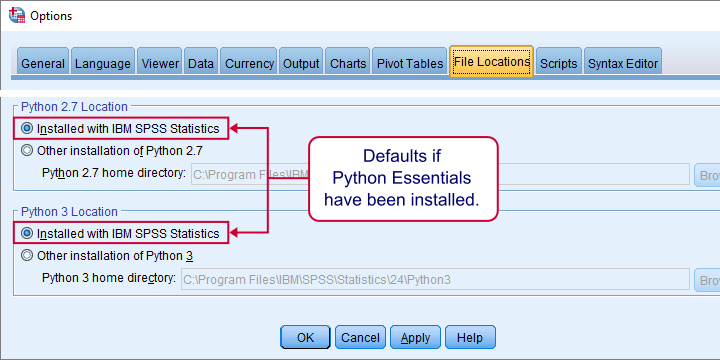 For recent SPSS versions, you'll need to completely reinstall SPSS with the Python Essentials to fix the problem. That may take some effort but it'll be well worth it. Previous tutorial: SPSS with Python I – What is It? Next tutorial: SPSS with Python III – How Does It Work? That's strange indeed. What about other Python based extensions? And if you run a tiny piece of SPSS Python syntax, does it run properly? I have Python Essentials installed in SPSS 25. However, the Create Dummy Variables extension command does not appear under the Transform menu. Yes, after installing Python 3.7, have SPSS use this version under (SPSS menu) Edit -> Options -> File locations. One problem of the standard SPSS Python installation is that no Windows registry key is created for Python. An alternative is creating this manually yourself. That's kinda tricky but it's worked for me in the past.